1. Seen on Twitter: “@Joelle_o: As soon as you stop seeing blogging as over saturated and more of a community, things will turn around for you! #socialbloggers“. I highly agree with this statement. The moment we see blogging as a way to connect and engage with other like-minded people, we start having more fun and more meaningful conversations. We stop being as anxious about stats because numbers don’t matter as much. Blogging becomes more about quality than quantity and that is reflected in a richer content of each blog within a community of bloggers. Ingrid’s (Ingstyle) Connecting With series is a great example of this. 2. Speaking of bloggers who know how to create that sense of community – Kristian (Never Fully Dressed (Without a Style)), I’m thinking of you! Kristian has a Q&A series where, each month, she asks a handful of bloggers one question. Every month the question is different and so are the bloggers who get to answer it. This results in a diversity of views and rich conversations. This month, I was lucky enough to participate and share my view on the 5 things every girl should have in their closets. Head over to Kristian’s to see what the answers were and join in the conversation! 3. I have been sighing over Vittoria Puccini’s wardrobe in a 2013 European production of Anna Karenina for TV (Rai). OK, I confess, also Santiago Cabrera…ahem, I mean, his military wardrobe as Count Vronsky is also very nice to look at. Not my favourite Tolstoy book and I never cared much for the 2012 movie. However, this miniseries has amazing quality both in acting and production so I couldn’t resist watching it. Unfortunately, I can’t seem to find the full English version and had to watch it in Italian. Just one of those moments where I really appreciate being a native Portuguese speaker. 4. My Popbasic navy Le Breton has finally arrived! It’s now cold Winter in Auckland so I haven’t had a chance to wear it but I’m so excited about it. The fabric looks and feels like great quality (which I am sure time will test). I picked a size M and it runs a bit bigger than I expected but it’s actually perfect for travelling and to wear with skinny jeans or leggings. It will still be perfect to tuck in with a skirt. Nevertheless (and because there’s no such thing as too many Le Bretons) I will get another in size S. Have you grabbed one? If not, grab $15 here* and join the #PopbasicLeBreton community! Thanks Maddy. I didn’t know that! *I am a proud ambassador of Popbasic and this link is part of their referral programme. 5. Massimo Dutti has such gorgeous items and style going on. I’m currently loving their leather jackets, especially with woollen sweaters. I love the contrasting fabrics and textures. 1. This post by Girl With Curves, or better yet, the subsequent discussion, highlights the need to acknowledge that each individual’s journey has its own value. 2. While browsing the shelves of The Bread and Butter Letter one day after work, I found this inspiring magazine. Extra Curricular is all about the creativity of making and doing. Each issue has a theme and I started with the latest (Autumn/Winter 2014) The Wild and Free issue. I went back this week and picked up the New Beginnings issue. It’s like a beautiful little book I can carry around as a creative pick-me-up after a long day of office work! 3. Another Portuguese shoe brand – Weekend Barber – popped into my radar this week when I saw their beautiful campaign photos on Pretty Exquisite. I am so glad my country’s shoe-making craftsmanship is not only surviving but thriving in such harsh conditions. Talk about Portuguese resilience! 4. This post by Ingrid from Ingstyle reminded me of the beauty of traditional outfits in Europe. A few years ago I realised that my northern (and north-eastern) European friends wore theirs with pride, while in Portugal the post-dictatorship generations, myself included, had a certain shame of ours. A trip to Tallinn in July 2011 for the Song and Dance Celebration changed my perspective completely. I am looking forward to have my very own traditional outfit made for me when I’m next in Portugal. 5. And, finally, a bit of shameless self-high’fiving: My Small Stuff post was selected for this week’s Brilliant Blogger Sets of the Week on Polyvore and was then featured on the site’s home page! Also, Sapataria do Carmo had the sweetest post on their facebook page about the blog – thank you guys! 1. 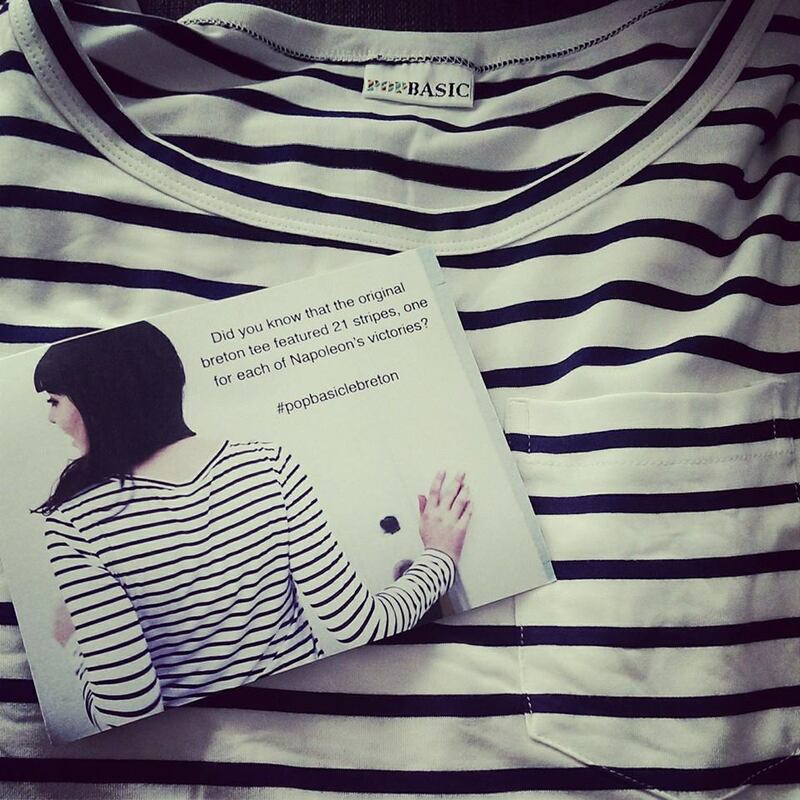 Of course, the first highlight of the week was the re-launch of Popbasic’s Le Breton. I ended up ordering 3 – one for myself and the others for my sisters. We will be the 3 Le Breton sisters!! 2. While on the topic of stripes, this post by Caitlin at Thistle & Tea had the cutest + most unique striped tee! 3. I would live inside this store! It’s now on my list of places to visit when I go to Sidney. 4. This post by Sacramento at Mis Papelicos was inspired by patios Andaluces and it just reminded me of home so much! 5. On the topic of flowers, how gorgeous is this Spring flower guide? It’s Spring somewhere right? I’m highly allergic to Spring pollens so can only admire these beautiful creations of nature from the safe distance of my computer. I’ve gotten a taste for this type of post where I get to share with you a handful of topics that pop up in my radar. So, grab a beverage of your choice and enjoy a break. 1. I have arrived at the Wes Anderson appreciation party late but am trying to make up for it quickly. After watching The Grand Budapeste Hotel last week, the hubby and I decided to catch up with all of Anderson’s previous work. We’ve started in reverse chronological order and will be watching Fantastic Mr Fox next. Are you a fan? 2. Totally agree with this post over at Musings of a Curvy Lady. 3. This post by Caitlin over at Thistle & Tea reminded me of the Persona work by Jason Travis on Flickr. I love this work and have followed it for a few years but do wonder why we’re so attracted to what other people carry in their bags…We humans are such weirdos! 4. A few home/design bloggers put together a room by room gift guide for mothers day. It appears most countries will be celebrating this date soon. If you’re still looking for inspiration, there are a few good ideas in there. They’re great even if you’re looking for something for the child-free ladies in your life! 5. Just a few comments on Mad Men. Wait, what? You don’t watch Mad Men? Oh well, you can get back to work now. Sadly, your break is over. Now for those who do watch – what the hell is going on with Don?! It was so painful to watch him in this last week’s episode!! Simultaneously, it’s great to see how Peggy’s style has changed over the seasons to reflect the confidence she has developed (or is it the confidence she wishes to have?). Loved her hair too. 1. Josefinas released their happy-looking Spring/Summer 2014 collection. Which one would you pick? 2. This mid-week-casual outfit pairing stripes with leopard print: we’ve been having a really mild Autumn and we’ve only started to have a bit of rain this week. Got the trench out but still warm enough for a light tee and flats. 3. Exciting news: Popbasic is about to make a few items permanently available, starting with my favourite Le Breton tee, not just in dark blue but also in red! 4. This beautiful Pink & Gold outfit by Susana from A Key to the Armoire. 5. A modern take on the style from Rear Window, by Kristian from Never Fully Dressed (Wihtout a Style).